Brothers John and Bob Hendricks had two fundamental, yet essential ideas in mind when opening the doors to Outdoor Solutions in the spring of 2007. They wanted to offer the greatest selection of landscape materials available while providing the best service in the area. 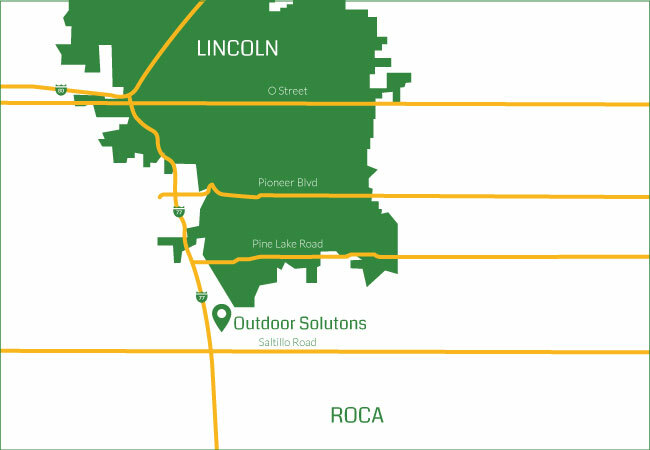 Outdoor Solutions has definitely delivered, and since then has become one of the largest landscape retail yards serving Lincoln and surrounding areas. Located in Southwest Lincoln, Outdoor Solutions is your leading landscape headquarters and has more than enough room to showcase its impressive assortment of decorative landscape rock, flagstones, boulders, mulches, topsoil, retaining wall, pavers and construction materials. And, with delivery available, your products can be brought right to your doorstep. The spacious storefront features outdoor pottery, bird baths, garden products, pond supplies, and much more. Home owners and contractors alike can enjoy the superior collection of products available at Outdoor Solutions. Whether your yard is getting an entire upgrade, or you simply need some new pottery for your home, Outdoor Solutions is your ideal stop.